In the middle of September 2016, Cemetech ASM expert and moderator MateoConLechuga decided to port the popular Nintendo game Mario to the TI-84 Plus CE. He started this game in ASM, but soon moved to C, using the libraries he wrote himself. Upon switching to C, he also renamed the game from Mario to "Oiram" ("Mario" reversed) to avoid problems with copyright infringement. After much nagging and poking from an impatient userbase and a few months of updates and gorgeous screenshots, he has now released Oiram! The game includes everything you'd expect from the original game: full movement, side-scrolling, goombas, turtles, fire sprites, shells and much, much more which makes this game into one of the biggest games released so far for the TI-84 Plus CE. But that's not all! 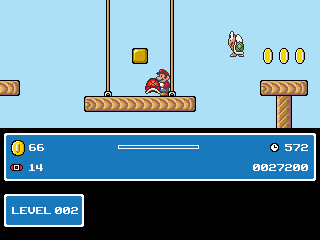 Like the real Mario game, Oiram includes time, coins, powerups and a score system. 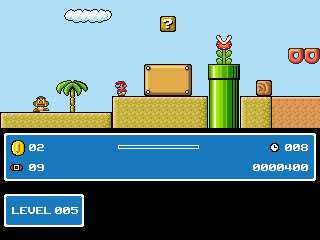 Mateo has created 12 levels, full of enemies, powerups, koopas, slopes (! ), pipes and... hidden things! If you're sufficiently dedicated that you happen to beat all of the levels, you can keep the game interesting by making your own levels. Mateo has created a simple but useful Oiram Level Editor, which provides a GUI where you can make your own levels, and export them all together to an appvar. Simply send this appvar to your calculator, and then you can play your own levels. If even this was not enough, Mateo has made the game open source, so if you want to learn how to write a platformer game, take a look! Yeah! It looks like very cool! French student in electrical engineering, 21 yo. This is really amazing work, Mateo; I'm impressed that you wrote it from scratch, rather than port it from any existing open-source C implementation. And you did it so fast! I look forward to seeing how this takes off. Quoting another user without saying anything new is not a permitted type of post on Cemetech. Thanks guys Although I would like to point out that the libraries are not my work; but rather a combination of a lot of dedicated people Specifically jacobly and grosged, and Runer's optimized routines as well. Stunning work Mateo! I've never seen anything like it! 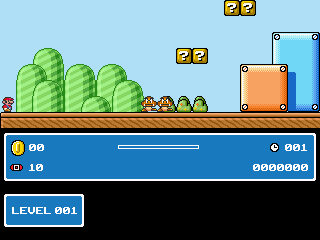 I'm working on porting original Mario Bros levels with your level editor. One teensy bug: pressing the sprint button while airborne causes the player to sprint... in midair. one question, why can't I fire the boss in level 12? Because it is a boss? so how can i fight him? That might explain his confusion. He destroys bricks under him when he jumps. Make him carve a hole so that he ends up falling in. On my TI 84 Plus, I get a message saying "ERR: VERSION"
EDIT: I tried to open it via the catalog (2nd+0) and I got a different message saying "ERR: INVALID"
There are 221 users online: 2 members and 219 guests. © Copyright 2000-2019 Cemetech & Christopher Mitchell :: Page Execution Time: 0.166580 seconds.